I have been debating whether to publish this or not – there has certainly been something pushing me to write it out, that’s for sure. Does anyone really want to read about the past three days and the turmoil I have been feeling? I decided to start with Monday because that was about the start of it and it has been uncomfortable up until today (Wednesday). Not sure if there is a happy ending or just an ending. 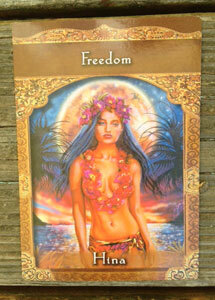 “This card signifies that your Soul is crying for more freedom, especially as it involves your life purpose. Walk away from restrictions and be free! Perhaps it’s time to take a break so that you can think clearly about your desires and available options. Are you ready to break free? Is it time to leave a certain situation? Why wait? Feeling fear means you’re on the right path. Just don’t let fear to stop you if your heart guides you to take a leap. Then I read the second one and it too was so fitting for me – it always amazing at how apt the cards are for me. 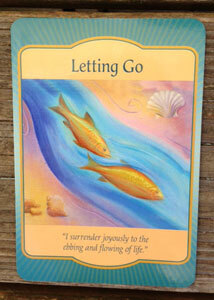 Letting Go: I surrender joyously to the ebbing and flowing of life. What area of your life needs letting go? This week your focus is letting go and creating the freedom to pursue the longing of your Soul. What baby step can you take? Unfortunately it was not to be – Eddie got another Dept. of Justice virus demanding $300 within 48 and they would unlock his computer. If not, he would be prosecuted. No doubt a lot of other people have had this come up for them. this time we knew it was a scam, but I couldn’t get it to start in Safe Mode so I could do a system restore. I called Larry and he said it would be very expensive to fix it, though he sent me a site that has ways to do it. Unfortunately they all seem to have it go into Safe Mode – something I couldn’t get to. So I called Jon Palms from Breakfast Club, he is the computer guy in our club at the moment and others have been pleased with his work. So I called him and when he wasn’t able to help me over the phone, he came over to fix it. It took awhile but he found several viruses and took them all off as well as the DOJ one. then ran a deep scan which found 2 items to be removed. Now it is working properly. There is always a chance it will happen again so now Eddie is willing to look at a Mac laptop since there are fewer problems with viruses. He thinks they are too expensive, but I reminded him how much money we have spent fixing all the problems he has had with it. By the time Jon left, it was almost 2 – there went my day to myself. It really began to bug me because this happens quite often, it is my life that is put on hold, postponed or cancelled because Eddie or Mom needs something done. I am fed up with it. I said it to Eddie when he called the last time, he told me he owes me big time – you bet your a** you do! I was upset about it and in many ways fell into feeling sorry for myself and thinking of myself as a victim. It certainly was a familiar feeling, I have spent a lot of my life that way. After awhile, I began to think “I have been down this road so many times before but didn’t do anything about it” I then heard my higher self speaking, asking what I am going to do, this day has been a wake up call to begin doing what I enjoy, what I want learn and explore. I was still feeling a bit upset and didn’t say much that evening. This entry was posted on May 8, 2013 at 7:04 pm and is filed under Musings. You can follow any responses to this entry through the RSS 2.0 feed. You can leave a response, or trackback from your own site. A friend of mine says, “It’s all sent to try ya.” Upon reflection, that’s probably all that can be said. The link is to the free version and I find that running it every 4 to 6 weeks keeps the malware and spyware at a minimum. I’ve also switched to microsoft security essentials as my virus scanner of choice. It, too, is free. Thank You Maurice. Last night we out and bought a Mac Book – I have had no trouble with my iMac and we have spent too much money on that Dell. Actually, Jon had that malware program running while fixed the computer. Know anyone who would like to buy a Dell laptop? LOL! The problem is that PC prices are so low right now the resale value is miniscule. Right now a brand new Dell inspiron laptop can be had for less than $400! That’s less than an iPad! If I don’t ask, I won’t find out. That’s about what I was thinking, I may give it to my pc guy. We’ll see what happens. Thank you so much for following my blog and you wonderful comments. I think people with chronic illness, no matter what it is, often experience many of the same type of things. I look forward to looking at your site – I like your premise a lot. I have tended to think – why would anyone be interested in what I have to say? However, as I have read comments and blogs, plus people following my blog, I have come to believe I do have something to offer, I may not always know what it is, but as long as it helps someone, it is valuable. Even better, I get to know about other blogs, other people and I learn so much from them. Each of us has something valuable to say and this is my voice, my way of doing it.